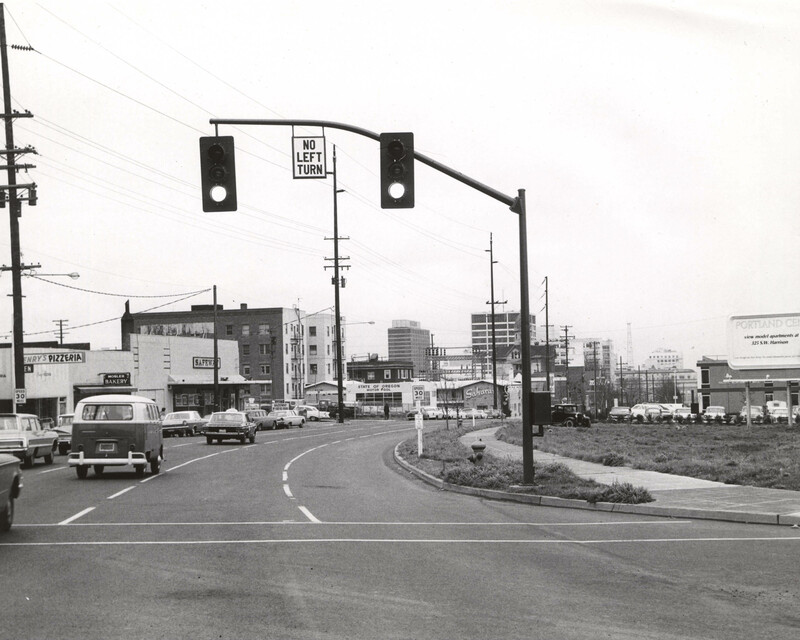 Once upon a time NW Lovejoy Street was elevated, from NW 14th Avenue to the Broadway Bridge. 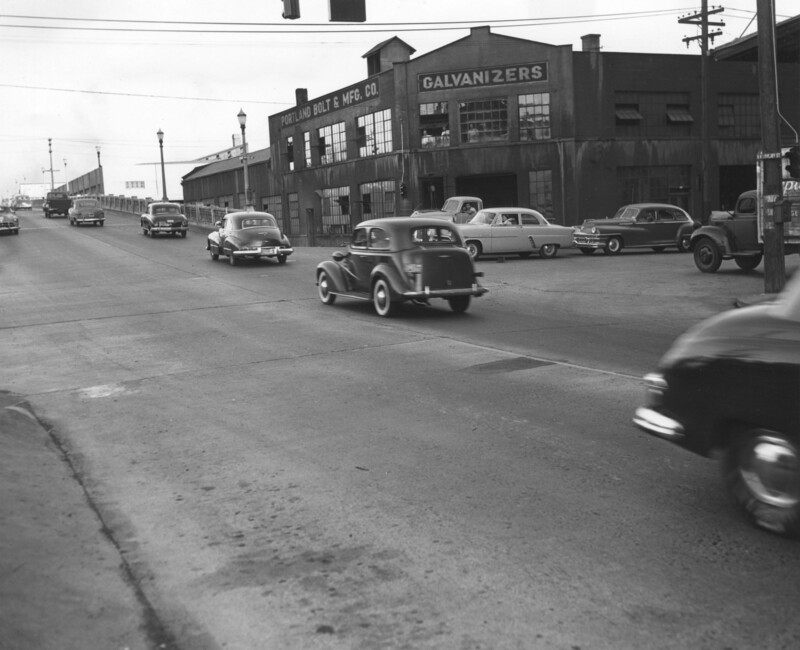 This view looks east at 14th where the ramp took drivers over the (now gone) railroad tracks. That overhead portion was removed in the late 1990s and now the ramp to the bridge begins at 9th Avenue. 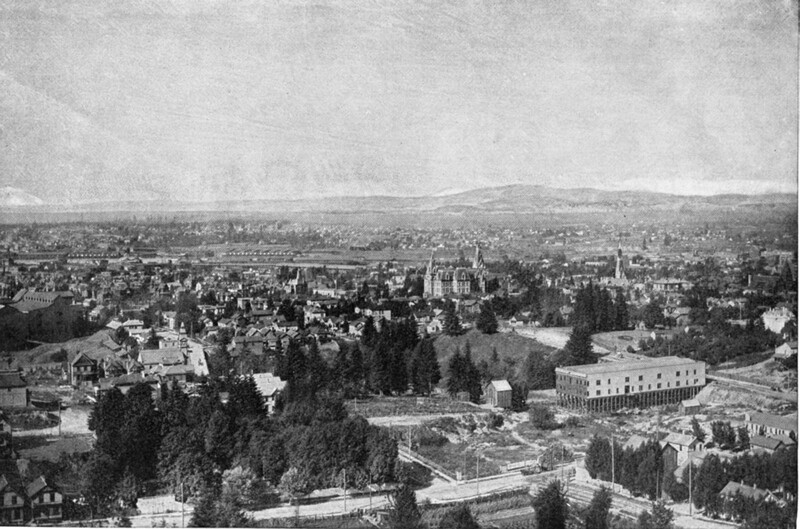 Goose Hollow is shown in this 1892 photo from the hillside above. Jefferson Street cuts left-right across the bottom while 18th goes diagonally from bottom-right and crosses in front of the Exposition Building at left-center. The large building at lower-right is still with us today but the surrounding area has been filled in so that the main structure is at ground level. 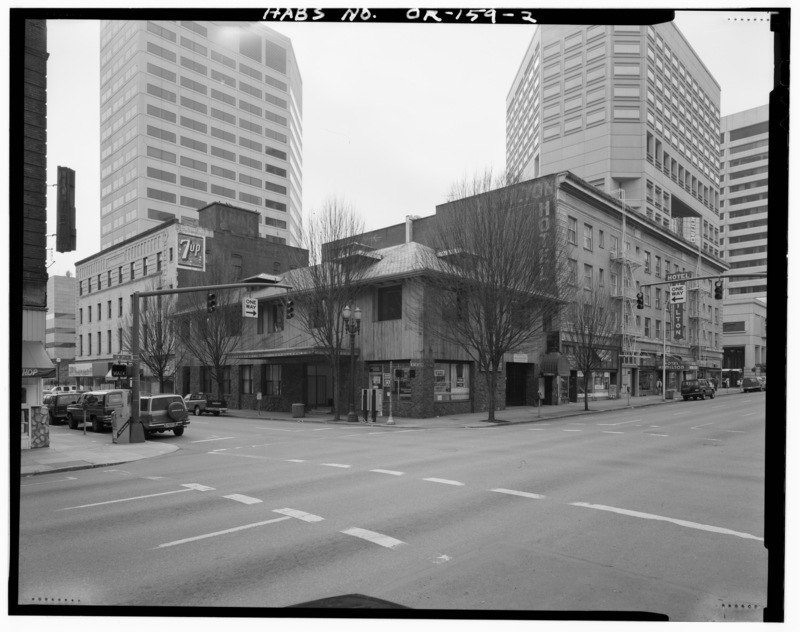 The “Just Us” restaurant and tavern, in this small building at SW 3rd & Salmon, was probably a hangout for the area’s legal professionals before this block was torn down for the Mark O. Hatfield United States Courthouse. It was flanked by the Geneva Hotel and Hamilton Hotel. This view is to the southeast. Reservoir #2 once sat on the lower south slope of Mt. Tabor. Decommissioned in the 1980s, the filled-in reservoir is now a retirement community and the gatehouse shown at upper right is now a private residence at the corner of SE 60th and Division. 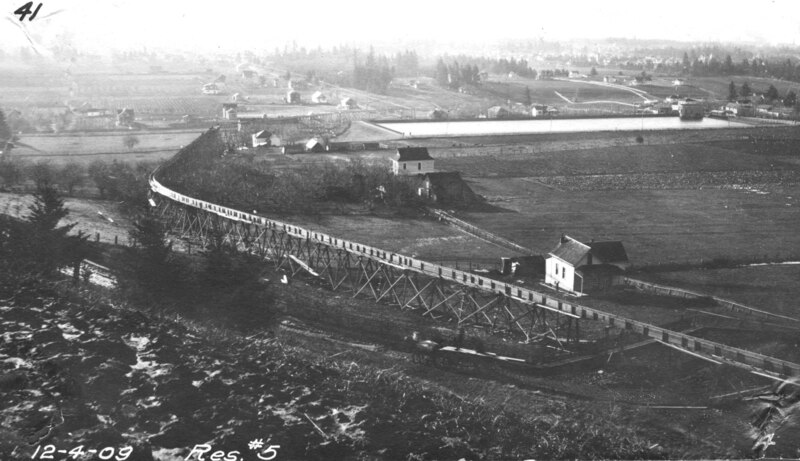 The elevated railway was apparently for construction of reservoirs #5 and #6 farther up the hill. 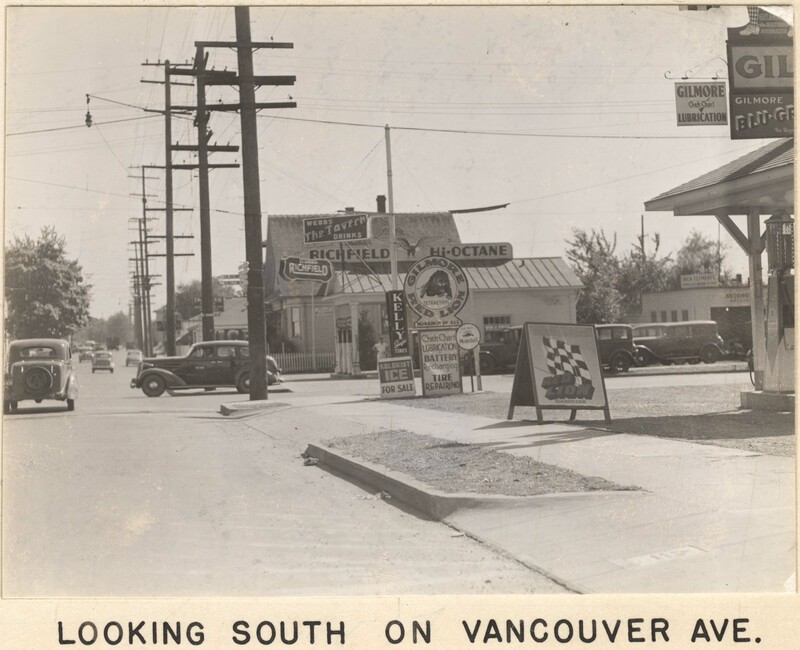 Richfield and Gilmore service stations once adroned two of the corners at N. Vancouver Ave. and Fremont Street. I wonder if Webb’s “The Tavern” was actually in the Richfield station. 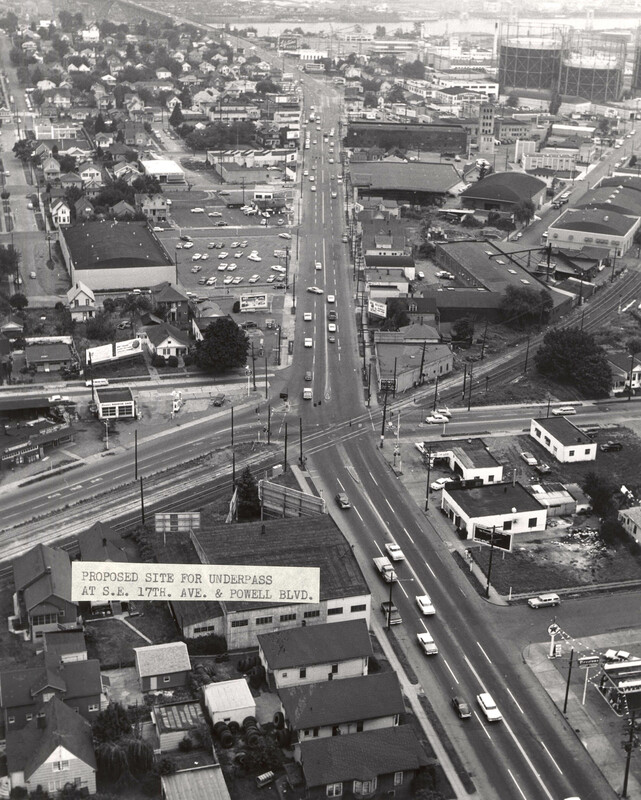 This area around the PSU campus has grown up quite a bit since the mid-60s, especially east of 4th Avenue (which was part of the South Auditorium Urban Renewal District), but it’s still pretty recognizeable today. This view is north on 4th at Lincoln.